You’ve just arrived at one of the busiest airports in the world: Incheon International Airport, South Korea. It’s only 6:50 in the morning. Your connecting flight is at 8:00 this evening. What to do for the next 13 hours? 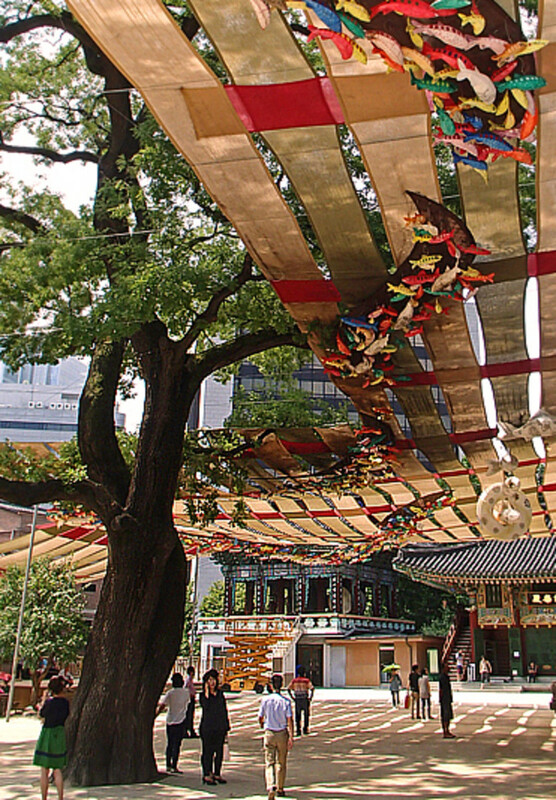 You’ve never been to Seoul before, why not take this opportunity to get out of the airport and do some sightseeing? To make it easier, Incheon International Airport offers Free Transit Tours—guided tours to visit some of the most popular tourist destinations in Seoul—specifically geared toward travelers with a long airport layover. There are several tour options, varying from one to five hours, and you can book a tour at any of the Transit Tour Desks located inside the airport. 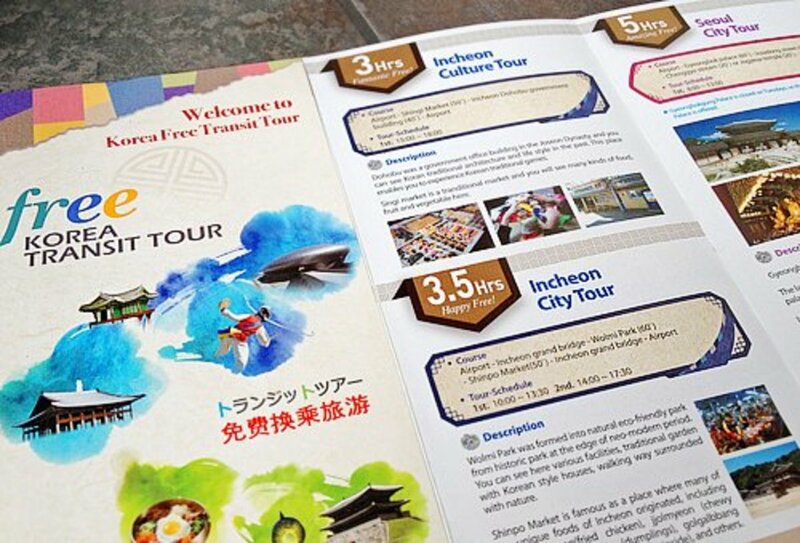 Have you taken a Free Transit Tour at Incheon International Airport? At the transit tour desk on level 2F a friendly receptionist helps you select a tour that fits your layover time. She suggests the 5-hour Seoul City Tour which covers 3 top tourist attractions: Geyongbokgung Palace, Jogyesa Temple, and Insadong Street Market. The tour leaves at 10:00 in the morning and returns to the airport approximately 3:00 in the afternoon. Transportation and a tour guide is included and free! 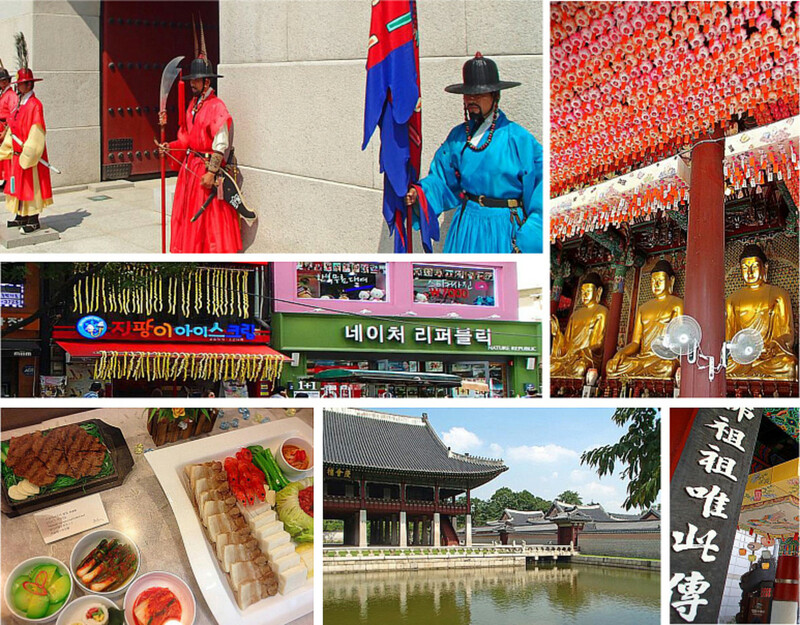 All you have to pay is the entrance fee to visit Geyongbokgung Palace ($3US) and lunch at Insadong Street Market ($7US). You also need to present your passport, flight tickets/boarding passes in order to book a tour. At 10:00, you meet the tour guide and 20 other travelers (who signed up for the same tour) on the airport’s ground level. The tour guide—who can speak multiple languages—leads your group out to the street where a large tour bus is waiting. The bus driver takes your carry-on bag and stores them safely inside the luggage compartment. Settling into a comfortable seat on the bus, you’re off to explore Seoul! 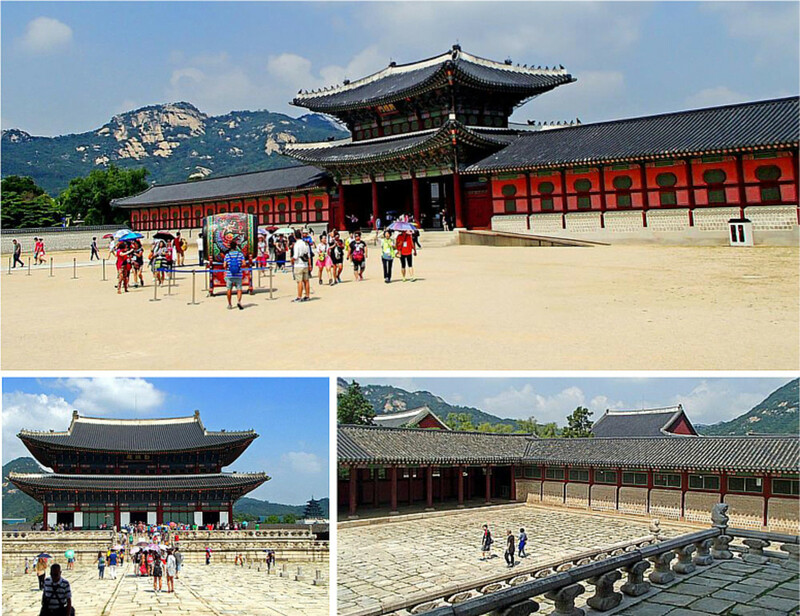 Gyeongbokgung Palace is the grandest and most beautiful palace in Korea. 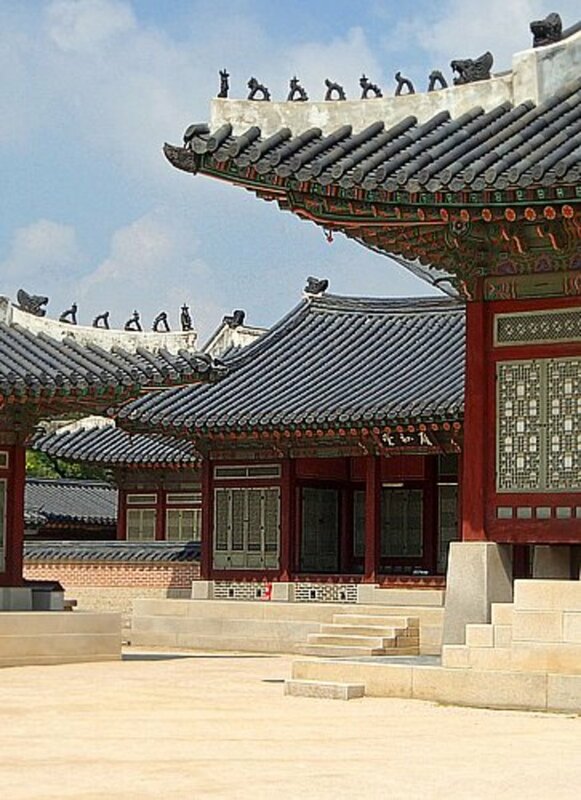 Built in the 14th century, it served as the home of the Joseon Dynasty Kings and royal families. Located in the heart of Seoul, Gyeongbokgung (means “Greatly Blessed by Heaven”) Palace is a massive complex of some 500 large and small palaces, with countless gates, bridges, gardens, and courtyards. 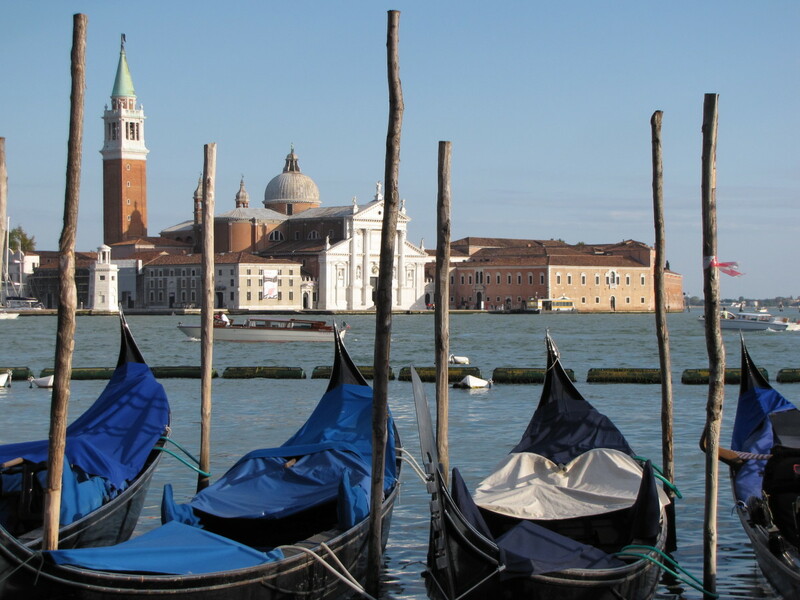 These magnificent structures have survived centuries of wars, disasters, and neglect. Many have been carefully restored to their former glory, thanks to the South Korean government. It can take hours to walk through the immense palace complex! During the tour, the tour guide points out some major buildings, like the Throne Hall, the Council Hall, the King’s Residence, and explains their historical significance. You will have a chance to climb up an enormous staircase and peek inside the Inner Chamber where Kings once slept! Another highlight is the breathtaking Gyeonghoeru Pavilion—built on an island in the middle of a lake and connected to the palace grounds by three spectacular stone bridges. 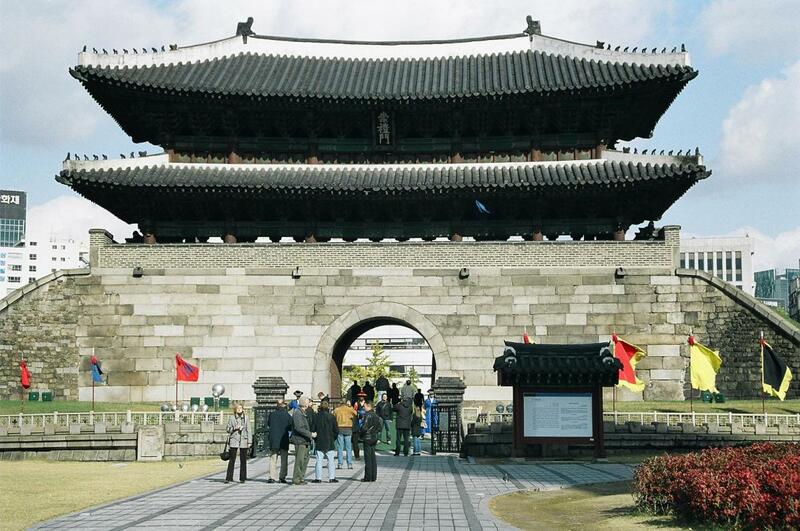 Being the number one tourist attraction in Seoul, Gyeongbokgung Palace is always crowded. Dozens of tour buses line up in the parking lot and the endless throngs of tourists can be challenging. After two hours of exploring the palace, it’s time to go to the next attraction. 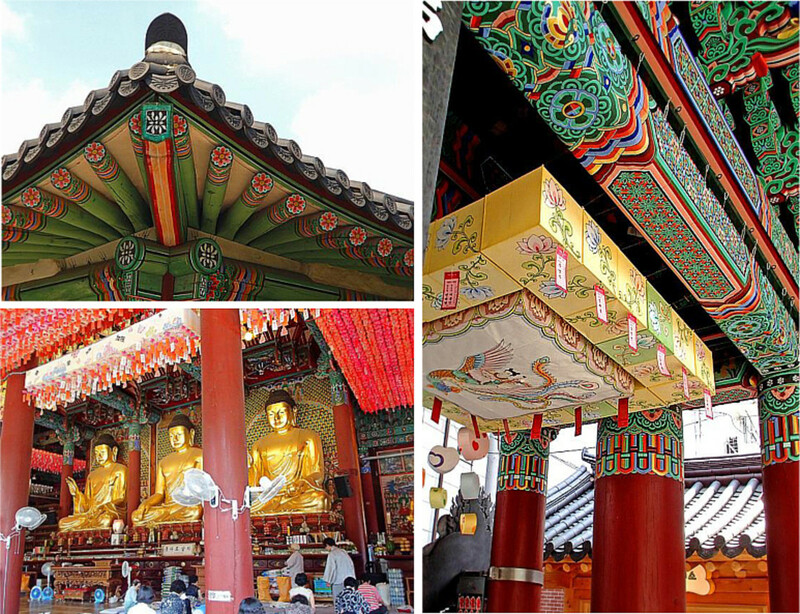 Built in 1938, Jogyesa Temple now serves as the head temple of the Jogye Order of Korean Buddhism. To enter the temple, you walk through a large gate called One Pillar Gate. The gate’s name refers to a single horizontal wooden beam that holds the entire gate structure together—symbolizes one mind. It is believed that when people pass under this gate, all scattered minds become one, enlightened by wisdom. Whether you experience enlightenment or not, you will feel calm once you step inside the temple’s courtyard. During Buddha’s Birthday month, the courtyard is decorated with hundreds of colorful Nirvana fish lanterns. The main temple (Main Dharma Hall) is situated at the center, under the shade of a majestic Pagoda Tree which is about 450 years old! Inside the Main Dharma Hall, there are 3 giant Buddha statues. Korean men and women kneel, bowing down and touching their foreheads to the ground to worship. The hall is filled with fragrant incense and the whispering sound of prayers. Located at the end of the courtyard is an ornate Bell Pavilion where the Brahma Bell is kept. Everyday, this bell is rung 28 times in the morning and 33 times in the evening, evoking the dharma (Buddha’s teaching) to end all human suffering. Also do not miss the exquisite Octagonal 10-story Stupa which houses a sacred Buddha relic. You may check out the temple’s gift shop and buy some souvenirs. Then it’s time to leave this peaceful place and head for the next attraction! The bus pushes through mid-day traffic toward Insadong Street Market. The tour guide announces that lunch will be served at a restaurant in the market area. 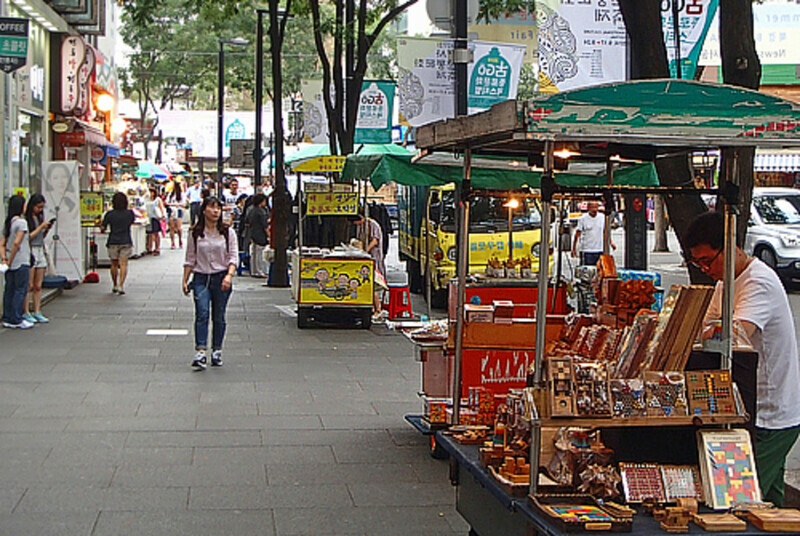 Insadong Street Market is located in one of the oldest shopping districts in Seoul. The street is lined with antique shops, art galleries, clothing boutiques, traditional tea houses, restaurants, and street food vendors. You follow the tour guide walking down a narrow alley and into a small family-run restaurant. As part of the Transit Tour, lunch is pre-arranged, you don’t need to order from the menu. Everyone in your group sits together at a long wooden table. Bibimbap is the main entrée—a traditional Korean ‘mix rice bowl’ of steamed rice topped with sautéed vegetables, hot chili sauce, slices of grilled beef, and one fried egg. The waitress also brings out a plethora of kimchi dishes! You will never see so many varieties of kimchi in your life! To enjoy bibimbap, just stir and mix everything together in your bowl and eat. Each bite brings out a different taste: spicy, savory, salty, sweet. Delicious! 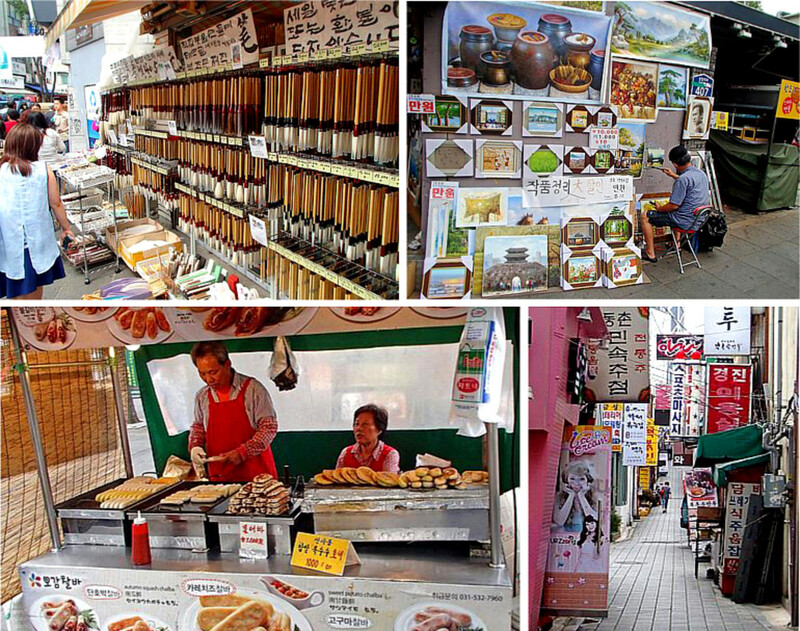 After lunch, you have one hour to explore Insadong Street Market. The main street is connected to a labyrinth of alleys and passage ways which lead to yet more shopping areas. Stores sell everything from expensive traditional Korean fine art (paintings, sculptures, potteries) to cheap, cute cell phone accessories. You will find it is quite entertaining to browse the storefront window displays! Tourists and locals flock to this market to hang out at the many coffee shops and street food stalls. 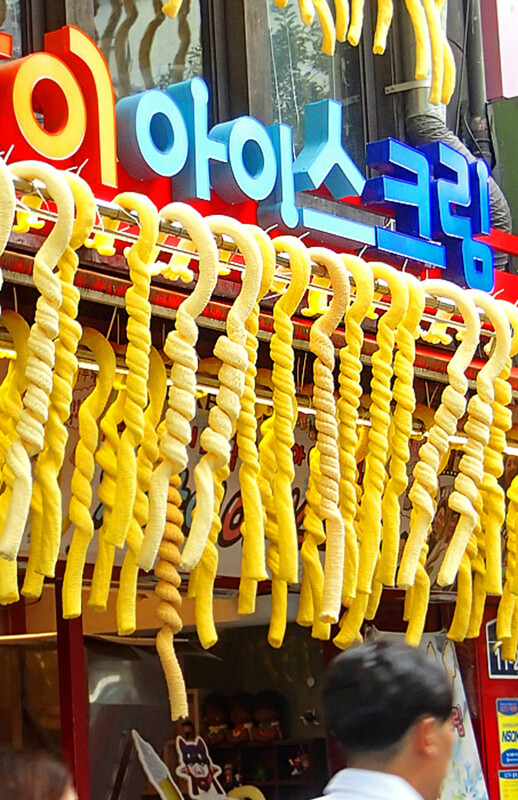 Must try the most unique and curious street food: a 3-foot long curly ice cream cone! It’s 2:30, you find your way back to the tour bus. During the half-hour ride back to the airport, you relax and enjoy the cool air condition after a full day of walking under the hot sun. Back at the airport, you thank the tour guide and give a generous tip to the bus driver when he hands over your carry-on bag. Then off you go up to level 3F, leisurely check through airport security, and find yourself inside the vast, modern departure concourse. You still have at least 4 more hours before your connecting flight. It’s time to go take a nap! Seoul is fascinating. 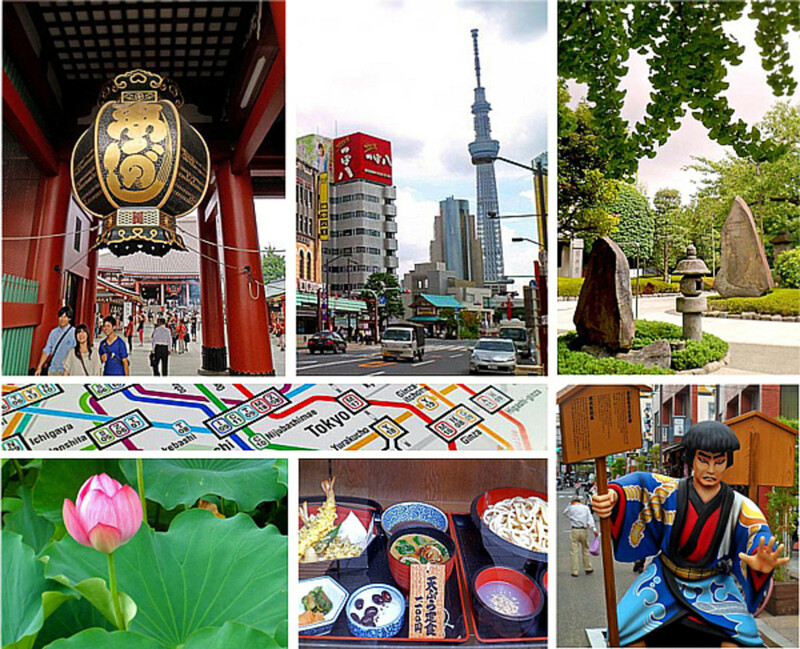 The author had a great time touring the city during his 13-hour layover. He loves kimchi! We have an 11-hour layover in Seoul. Could we join the Seoul City Tour? If you're US citizens, all you need are your passports and connecting flight tickets to sign up for the tour. Otherwise, check with the tour desk at Incheon International Airport. The agent will be able to answer your question. Can I pre-book a Seoul city tour? You can pre book the tours from their website. I have a link in the article. Or just google it! Do you need a visa to get out of the airport and join the tour? All you need is your passport. And your connecting flight tickets. The agent at the airport tour kiosk will ask to see these documents when you sign up/check in for the tour. Of course, you also need your passport and tickets to go through security to get back inside the terminals at the end of the tour. Keep these documents with you all the time when you are on tour, do not leave them on the tour bus. Can I take multiple transit tours in one day? It depends on how much time you have. The tour I took lasted all day, and by the time we got back to the airport, we had about three hours before our flight. We will have 11 hours layover in Incheon before we fly to LAX. Would we have time to book a Seoul tour? I highly recommend taking the tour, especially if your connecting flight to LAX is late in the evening. Talk to the receptionists at the Transit Tour desk at Incheon airport when you arrive, they will suggest which tour is the best for your layover time frame. I have an eleven-hour layover in Seoul. Do I have to go through immigration before I can join a tour? Yes, just like other arrival passengers, you will have to go through customs/immigration before you can leave the airport for the tour. Tell them that you are going on the transit tour, they will stamp your passport. When we take a tour during our long layover in Incheon Aiport in Seoul, do we bring all our luggage with us or will they store it somewhere for us? Your luggage will be stored inside the luggage compartment under the tour bus. You will get your luggage back at the airport after the tour. During the layover, am I going to pick up my checked in luggage and go to the tour and check in again before my connecting flight? No, you do not have to pick up your checked in luggage. 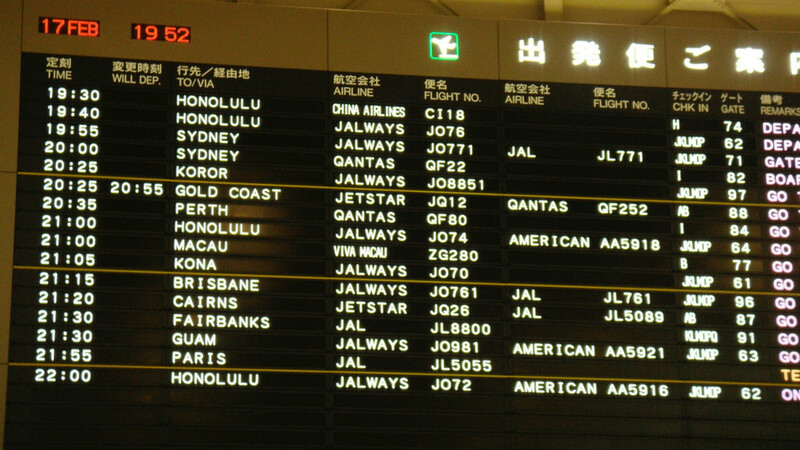 As usual, they will be automatically transferred to your connecting flight. If you have carry-on luggage (laptop, backpack, etc. ), you can take them with you on the bus or the tour guide will help you store them under the bus during the entire tour. I would love to take this tour on our 13-hour stopover in Incheon Airport in Seoul but also would like to squeeze in an hour shopping trip to any mall nearby. 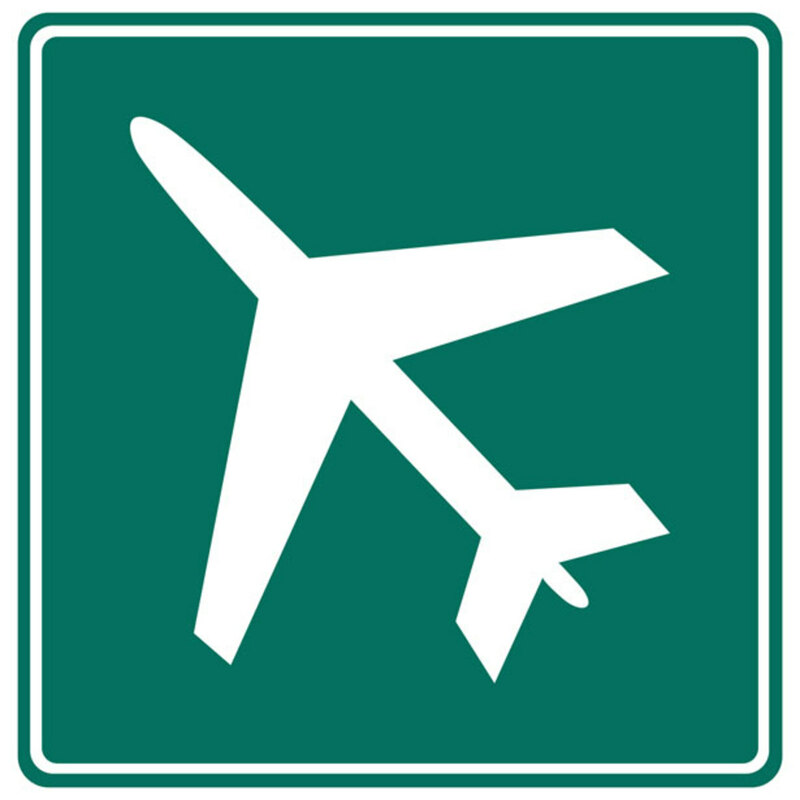 Is it possible to join the tour but make our own way back to the airport? I'm not sure if you can break away from the tour and go off on your own! If you want to shop, the last stop on the tour is the famous Insadong Street Market where you can get everything from the latest Korean fashion trends to electronic gadgets of all sizes and shapes! You will have about 2 hours here at this market! If you have more questions, please check with the agent at Incheon airport transit tour booth. Thanks Neil for your question. You can just walk to the Transit Tour Desk on the main level of the airport and sign up for a tour of your choice. The staff are very helpful and speak many different languages. I have a long layover this 2nd of April. From 4:50 am to 7:00 pm. Do I still have to register online prior landing Incheon to get the transit tour or can I just walk-in and ask about the tour? Please check with the agents at the tour desk regarding your visa status. They will let you know if it's legal for you to sign up for the transit tour and go outside the airport. Good luck! We have US work visa and 10 hour long transit at ICN airport. Can we go out for a city tour? Thanks Heather for posting a question. Personally, taking one 5-hr tour was enough for me. I can't imagine doing 2 back-to-back tours for a total of 10 hours! 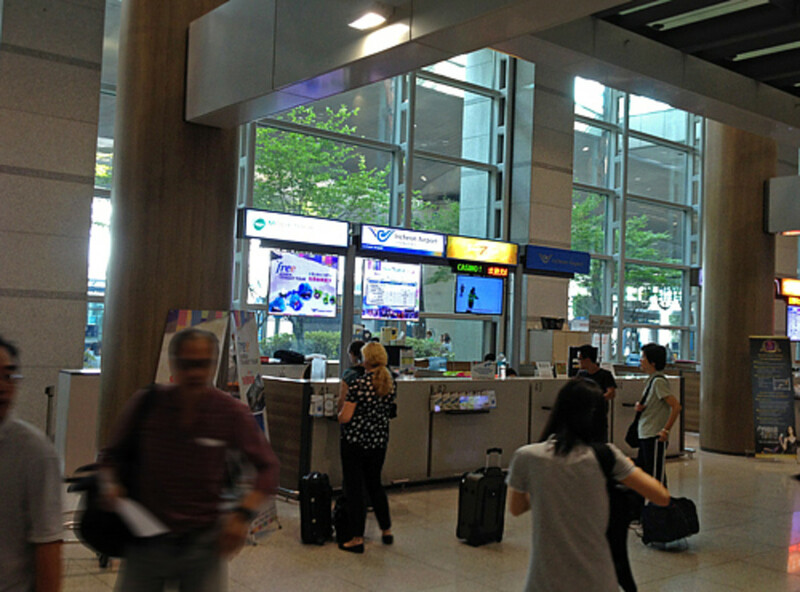 Talk to the agents at the Free Transit Tour kiosk at Incheon airport and see what they say. Good luck and have a fun trip! I will be travel to Philippines on December 6 from California and I will have a 14.5 hour layover in Incheon. Arriving at 5:20am to 8:50pm. I was planning to get the the 8am traditional tour which is 5hrs and the 1pm shopping tour also 5hrs. Do you think that they would let me do it? Because if they did let me. Going back to the airport I will have 1.5hours left before my flight... Do you think my plan is feasible? Hi Camille - all you need is your US passport to sign up for the Seoul City tour at the airport. And also your airline ticket showing connecting flights so you can get back inside the airport terminals upon returning from the tour. Have fun! Hi! Thanks for this!!! 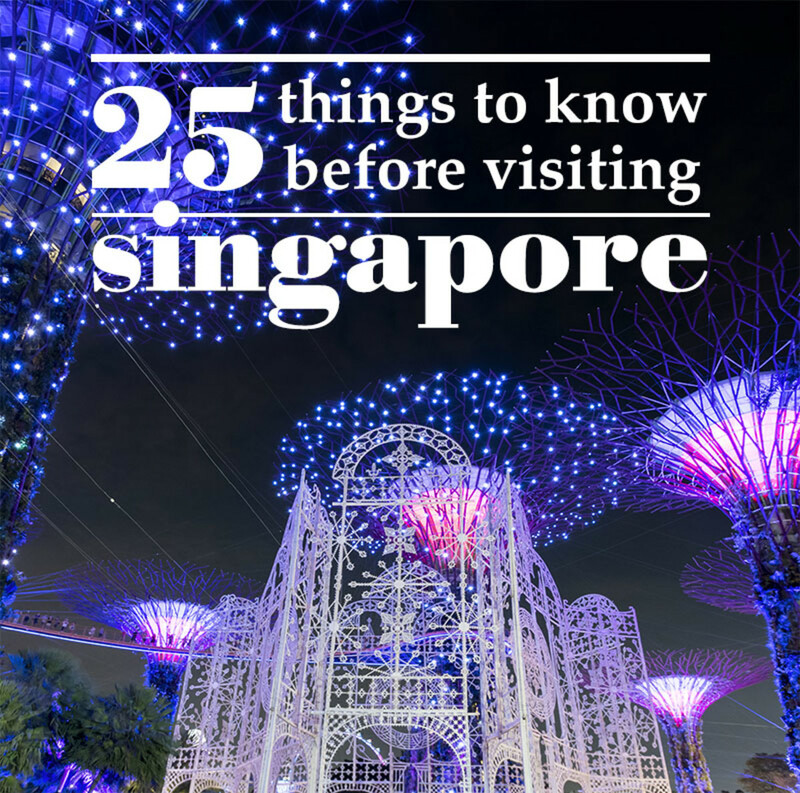 Do we need to get a Korean visa just in case we want to explore KR during our long layover? Thanks! i'll follow your footsteps! I'll be on a 15 hour transit in incheon to San Francisco! Im excited already! Thanks Mary! I think more airports at big cities around the world should offer free transit tours! It’s a perfect (and fun!) way to boot tourism. I hope to visit Seoul again and stay longer to explore this fascinating metropolis. Aloha! What an opportunity. We often just stay in the Lounge but next time we have a long wait, we'll take the chance. We were in Seoul once and enjoyed it. Thanks Anne! I do want to spend more time exploring Seoul in the future. Such a lovely city with interesting mix of modern and old. May be I'll see you there! Aloha. Thanks Patty! I did have a lot of fun shopping at Insadong street market. 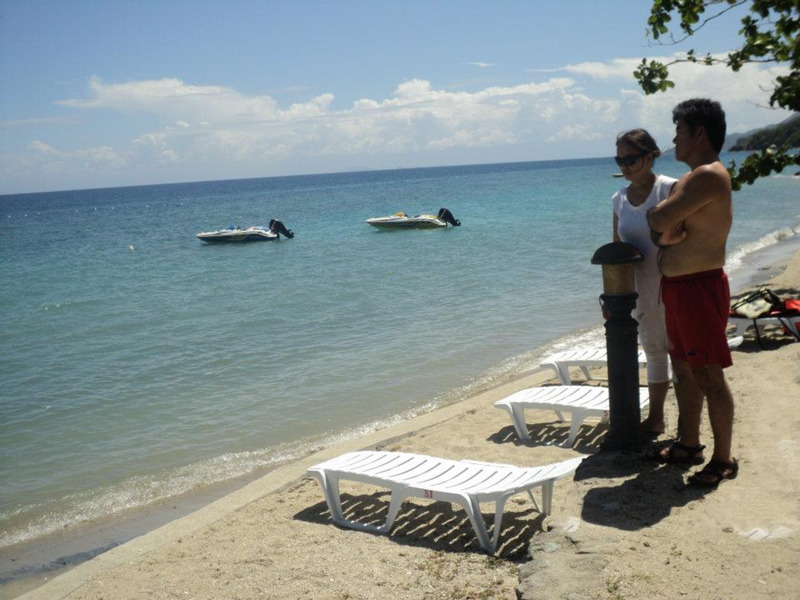 It's a great place for people watching too! Fascinating to see young, hip Koreans jam packed inside a Starbucks while old folks gathered in traditional tea houses. Aloha! Thanks Kristen! Glad you enjoyed the tour. I was quite impressed with Seoul during my tour. Hope to return some day and spend longer time there. Aloha! It is refreshing to see these photos and read about your wonderful day in Seoul. Our very few Korean restaurants in my city are long gone now and I miss the many kimchi appetizers and the bibimbop, along with the friendly people I met in such places. The marketplace must be fun to stroll! One friend has a mother who still lives in the mountains of Korea, in a rice-paper walled home. Viet, what a terrific visual travelogue in Seoul South Korea. Your photos were lovely and your descriptions were terrific. Thank you for sharing and taking us on this tour. Congrats on HOTD! 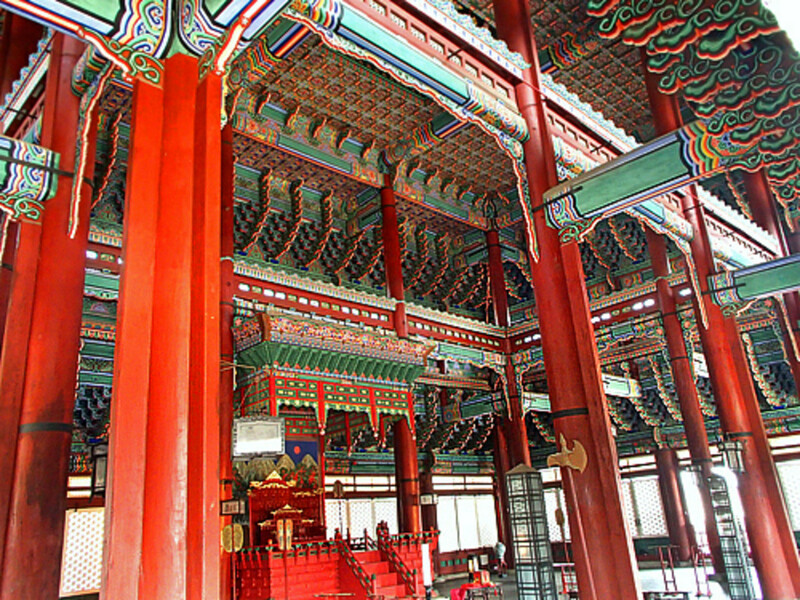 Gyeongbokgung Palace is truly an amazing place - architecture, history, culture, and all! You were so lucky to see the re-enacted ceremony! I really enjoyed my short visit of Seoul. Thanks for reading the hub and your comment. 3 years ago from Brisbane, Queensland, Australia. I spent a few days in Seoul and one of the Gyeongbokgung Palace - and just happened to be there on a day that they re-enacted an old custom which was an amazing ceremony. Awesome!! In filled my hours there in this amazing city. (I was teaching at a city south of Seoul for 3 months) and visited Seoul on a couple of occasions.